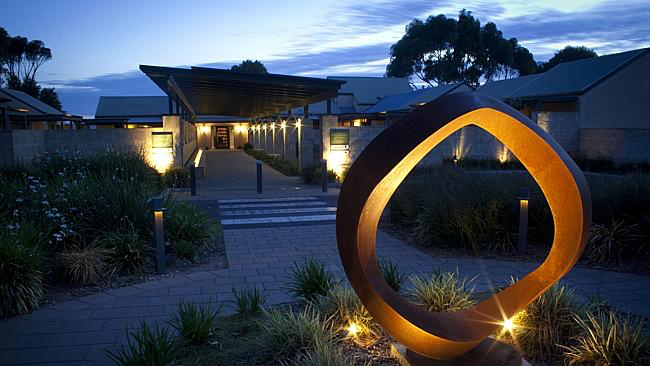 There are many incredible luxury hotels in South Australia. Whether you want to explore Adelaide city, venture to the Barossa Valley or witness the natural beauty of the Flinders Ranges, we have you covered for where to stay. In the heart of Adelaide’s rich cultural precinct is The Playford. It’s one of Australia’s most awarded boutique luxury hotels. If you’re looking for a truly relaxing getaway then we recommend booking one of the Studio Spa Suites. It has everything you could ever dream of and more, including a lounge area and a walk-in marble ensuite. All while you have the city’s arts, cultural and entertainment hotspot right on your doorstep. Stay in a stunning heritage-listed building that’s right across the road from Rundle Mall, which is Adelaide’s most popular shopping strip. It has 170 rooms and suites which feature modern amenities and luxurious extras. The venue boasts a gym, business centre and function rooms. You can also experience innovative food and wine at the Mayflower Restaurant, or you can check out the rooftop bar, Hennessy. Drive just 45 minutes from Adelaide and you’ll reach The Louise in the beautiful Barossa Valley. Enjoy your very own private terrace along with a spacious ensuite at this gorgeous retreat. You’re surrounded by a picturesque vineyard in a tranquil part of the Barossa Valley – that is, the old German town of Marananga. Take the ferry to reach the pristine Kangaroo Island, where one of the most beautiful lodges in Australia awaits. You’ll stay on a secluded cliff with incredible views of rugged coastline. You’ll soak up luxury and comfort as you explore the natural island, which is often referred to as Australia’s very own Galapagos. Stay here just a few nights and it’ll be difficult to leave. Do you want a luxurious experience with a difference? Then look no further than the award-winning Ikara Safari Camp. It’s far from your ordinary camping experience. Instead, you get to go ‘glamping’ with a luxury safari tent in the highest point of the beautiful Flinders Ranges. You’ll have your own private verandah where you can sip on some wine in the evenings. There’s also plush, king size beds, air-con and beautiful furnishings. Wake up every morning to your hosts serving you a delicious hot breakfast.